Fellow sailors snapped this shot of Glenn as he headed out the Straits enjoying the ride from the pulpit. This afternoon the sun broke through the clouds and revealed an indigo sea capped with white horses following and passing West Wind II. Her bow has a pulpit and in the pulpit is a seat that hangs out over the bow forward of the forestay. I worked my way up the heaving deck and climbed into the seat. I was there for an hour as WW II surfed – all 11 tons of her – on every wave that passed. I laughed out loud like a ten year old kid, over and over again as we rode each wave while the next one loaded ready for the rider. West Wind surges ahead on every wave changing the blue water to crashing white and making my stomach and body feel light. Her bow buries itself into the wave ahead till the wash touches my shoes that dangle from my perch. The sound was magnificent, exciting, crashing like surf over and over again. All the while the Fleming self steering wind vane mounted on the transom, held a firm grip on the tiller anticipating each wave bringing West Wind back from rounding up into the following wave and controlling that great surge as she gained momentum and sped down each wave maintaining a course I personally could not have while hand steering. Fleming had been doing this without food or water or complaining for four days straight! Another day aboard WW II. Fleming self steering vane sits off the transom of West Wind II. Day 8 : Just so you know, you sound like you are having way too much fun! Incredible journey, Glenn! Your description from here is like feeling it all myself! 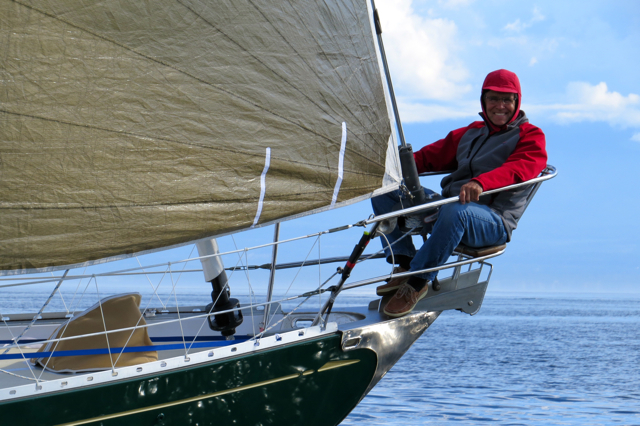 Happy and safe sailing ….we’re all rooting for you! Wow Glen the moment sounds fantastic! How did you get the picture of you in the pulpit? That particular photo was taken by friends who happened to be fishing near Sooke as Glenn and West Wind II sailed past on Day 2. They took the photo and forwarded it on to me on the home front. I thought that might be the case. It’s a great shot nonetheless . Cheers. day you’ve had! Loved the surf story. Fantastic descriptiion of what must have been another great day of sailing!! Hope you celebrated with strawberry icecream! Hello Glen. 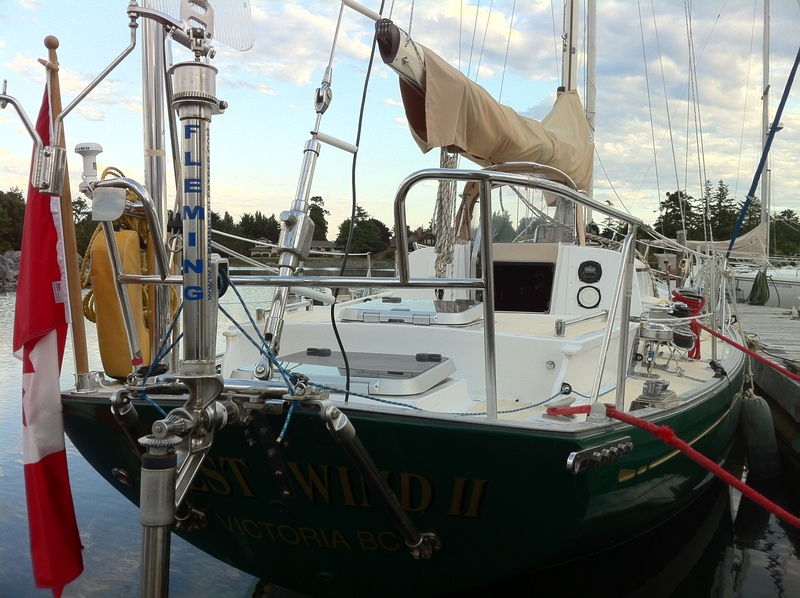 really enjoying your posts, gives confidence to my wife Cheryl and I to set sail from Victoria to Port Hardy on our 36′ Catalina on Sept.15th. Keep up the good work and be safe out their. Wow — what a ride, and what a wonderful description of it! I was practically brushing the spray from my face.